We received a copy of this title from the author, for review purposes. 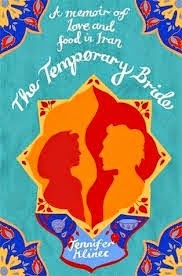 The Temporary Bride is a gentle read and certainly will engage the reader from the start. As promised in the title, it is a reflective piece that documents the journey from childhood to adulthood of Jenny whose independence has been instigated by responsibilities delegated to her at an early age by emigrant parents who wanted to make a success of their opportunities in the New World. In parts it stretches the reader’s credulity in that at such an early one would be studying and living independently in a foreign country; however the narrator has throughout a keen eye for observation and reflection. Any situation viewed through the prism of the stranger or the outsider brings with a sharp focus as can be seen in this book. This certainly culminates in her journey to Iran and as part of her quest to broaden her knowledge of the food of that country. However, the journey that begins as a culinary odyssey introduces her to the realm of the domestic; this is the rule of women not men. One might think Iran as a surprising and unlikely choice wherein to seek romance and yet this is exactly what happens. Yazid is where she learns about how Iranian’s eat in the domestic realm and how family life ticks along on a daily basis. However, its dark side is not avoided as depicted in the challenges she and her lover face as they fall in love and to avoid dire consequences she must become a ‘temporary bride’. The beauty of this county its cuisine and people is offset throughout by the many references to offal. Various animal body parts float across soups and stews and despite reassurances to the contrary by the narrator the reader is left under no illusion as to the allusory nature of the narrative. The depicted beauty of yellowstone buildings and elaborately tiled Mosques sits side by side with the imagery of the reality of the slaughterhouses and elaborate eye makeup that turns greasy and becomes less than alluring. It all ends happily and one cannot but be aware of the similarities between this work and the well known novel of Elizabeth Gilbert: Eat Pray Love; however it is a good read and one I would recommended to while away a few hours with a pot of tea on a rainy afternoon.